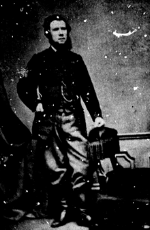 In the early hours of April 7, 1868, after a rousing speech in the House of Commons, McGee walked back to his lodgings in Ottawa. He had been renting a room in Toronto House at 71 Sparks Street, a.k.a. “Mrs. Trotter’s boarding house.” On arrival, he was cut down by an assassin’s bullet. His landlady, who was still awake inside, became aware of scuffling sounds. When she opened the front door to investigate, she heard a sharp crack. She found McGee slumped dead on the threshold, shot from behind at such close range that some of his teeth were found embedded in the doorpost. In this photograph of Toronto House, taken in 1868, an unidentified woman stands with a basket in her hand. Who was she? Possibly Mary Ann Trotter, whose establishment hit the headlines as the scene of the assassination of a high-profile Canadian federal politician. Flags flew at half mast as the shocked nation went into mourning. Henry James Friel, mayor of the city of Ottawa, posted a reward of $2,000 “for the apprehension and prosecution to conviction of the assassin,” and the federal government and provinces of Ontario and Quebec together offered an additional $10,000 in reward money. This was an enormous sum of money. It’s impossible to calculate exactly, as Canada only started tracking inflation in 1914, but $12,000 in 1868 would be equivalent in purchasing power to well over $250,000 today. Immediately following McGee’s death, a massive manhunt was launched and hundreds were arrested. Caught up in the police net was Patrick James Whelan, an Irish immigrant with strong Fenian connections. He’d been present during McGee’s speech in the House of Commons, and a gun was found in his pocket. With motive, opportunity and possession of a weapon all counting against him, he was found guilty of murder and sentenced to death by hanging. Whelan swore that he was innocent. “I am here standing on the brink of my grave,” he told the court, “and I wish to declare to you and to my God that I never committed this deed, and that, I know in my heart and soul.” Whelan’s lawyers launched two appeals against his sentence. Both failed, and in February 1869, Whelan met his end in a blinding snowstorm at the Carleton County Gaol in Ottawa. When he was arrested, Whelan was carrying a fully loaded .32 caliber Smith & Wesson tip up revolver, which had recently been fired. Although some say that there was only a weak circumstantial link between the gun and the crime, it became a crucial piece of evidence at Whelan’s trial and contributed to his death sentence. The firearm eventually found its way into the possession of Scott Renwick, an auto mechanic from Dundalk, Ontario. New and improved ballistic tests in 1973 at the Ontario Centre of Forensic Sciences showed that a bullet fired from the gun was very similar to the fatal McGee bullet. Although this did not prove conclusively that Whelan shot McGee, it did indicate that his gun might have been the lethal weapon. The Canadian Museum of Civilization (now the Canadian Museum of History) certainly regarded the revolver as “an icon of Canadian history.” In 2005, they bought it at auction for the sum of $105,000. On Easter Monday, 1868, McGee was given a state funeral — Canada’s first — on what would have been his 43rd birthday. More than 80,000 people, many of them perched on rooftops or dangling from windows, watched in silence as the funeral procession wound its way through the streets of Montreal. The funeral carriage was sixteen foot high and sixteen foot long. It was drawn by six grey horses with black ostrich plumes tossing on their heads. Solemn military bands all along the route played Handel’s “Dead March.” McGee’s body was laid to rest in his family mausoleum at the Notre-Dame-des-Neiges Cemetery in Montreal.